Callie loves to help choose fabric! Here is another block from Home for the Holidays, by Primitive Gatherings. Now that Nancy stitched all of the words for me, the rest of it goes pretty quick! I'm all caught up and waiting for her to mail the next batch. This is only 4", but it seems much bigger in the picture. My goal was to have this ready for the show in Dallas, I made it, but am cutting it plenty close! 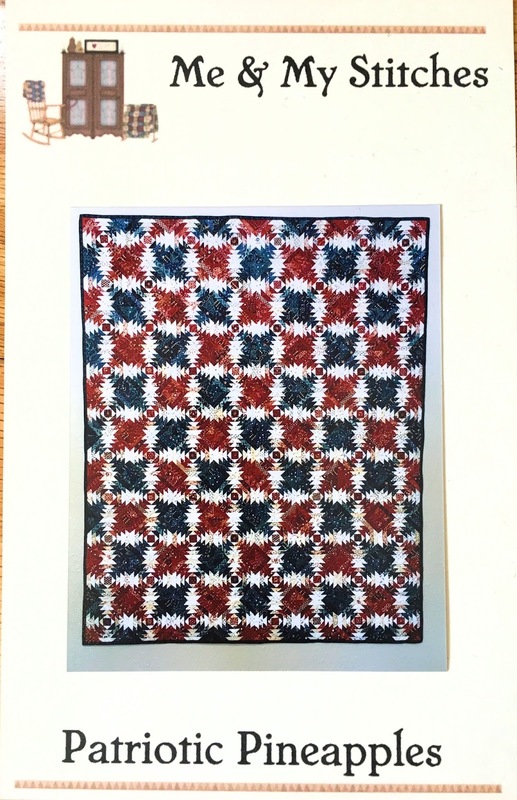 I wanted to make something that looked patriotic, and I have a nice stash of patriotic fabrics, so that is what I used for this, but wouldn't it be cool all scrappy? Oh, if only there were more time!! There are only a few more weeks until I go to the Dallas show, so we have been busier than ever trying to get ready. Here are some pendants that we finished this weekend - these are all 1 1/4". I have way too many wool applique projects in the works. Lat night I finished stitching my 3rd block from Home for the Holidays by Primitive Gatherings. See that helpful little kitty paw in the corner!? This one looks weird to me - the scarf is covering up part of him, and I keep thinking that he looks like he's missing a chunk. Too late to change it now - it is stuck down with Steam a Seam! I've been having a lot of problems with my feet, and was sitting with these ice packs for awhile last night. I shoved them aside (when my feet had turned into ice cubes) and the next thing I knew, Ozzie was resting against them - wonder if he had a sore shoulder? Silly cat. Back to work...my plan is to finish and print Patriotic Pineapples today! Hopefully by tomorrow the pattern will be for sale on my website. I had another super fun mail day last week - this was all from my friend, Nancy. See that awesome big basket? Love it! I've always wanted a basket from 1803 Ohio Farm Baskets, and now I have one! As you can see from the picture, Nancy also gave me a cool coloring book and markers, and an adorable little quilt that she made. The box of candy was from her kitties! Such a fun day! And look who came to visit! In the 20+ years we have lived here, I have never seen a bald eagle, but yesterday this guy went flying right by the window in my sewing room! He flew up into a tree and stayed there for awhile, then I looked out and he was on the pond, having a little lunch (eww). Pretty cool - and he was back this morning too. We've been looking for an antique buffet for my sewing room - I want to get rid of my ironing board and replace it with a buffet, then put my big board (for ironing) on top of that. It will look a lot nicer and will also be nice to have some extra storage. The hubby stopped at an antique shop in IL the other day and sent me some pictures of buffets, which I vetoed, but he did come home with these cute little spools. They are about 4 inches tall, and make a nice addition to my sewing room. It's no wonder it takes me forever to get anything done around here! Hope you are having a productive weekend! After sharing the 7 days of quilts challenge, you may think that I do a lot of hand quilting. I love to hand quilt, but it just doesn't seem like there is enough time in the day. I do try to sit down in the evening for at least an hour and do hand work, but for quite some time now, that hand work has been wool applique. I have several projects currently in the works. This is a block from a pattern called Blessed Bee by Wooden Spool Designs. I saw this pattern at Market last spring and had to have it, since hubby has gotten in to bee keeping. I had a terrible time trying to stitch the words - not sure why but they didn't look good. After tearing it out 3 times, I was ready to throw this entire project in the corner! I had all of the blocks prepped and most of the pieced blocks done as well, but I really was thinking of giving up. Well, evidently I whined a little (a LOT) and my friend Nancy volunteered to stitch the words for me. I resisted for awhile, because she has plenty of her own stitching to do, but one day, reality set in and I mailed them to her! Lol! She has sent 6 of them back, so now it's my turn! There's not that much stitching on these, they are pretty primitive - so they shouldn't take too long. Then maybe I will get back to hand quilting????!!!!! I know that I have spread this out over way more than 7 days here on my blog, but hubby is still working on my new computer. I think everything is good now, except my e-mail - it's not 100% yet. I know that a few of them have completely disappeared - so if you e-mailed me and haven't heard back, that's why. Those e-mails are lost forever in cyberspace! On to the last quilt of my 7 day challenge. This is one that you have probably seen here before, but it's been awhile. It hung in my local quilt shop for a long time (thank the good Lord that I had it back before they had a fire!). This is the quilt that always attracts the most attention in my booth when I'm vending. And it is the quilt that is the hardest to get a good picture of! The 9 patch blocks finish at 1 1/2" and it is super scrappy. 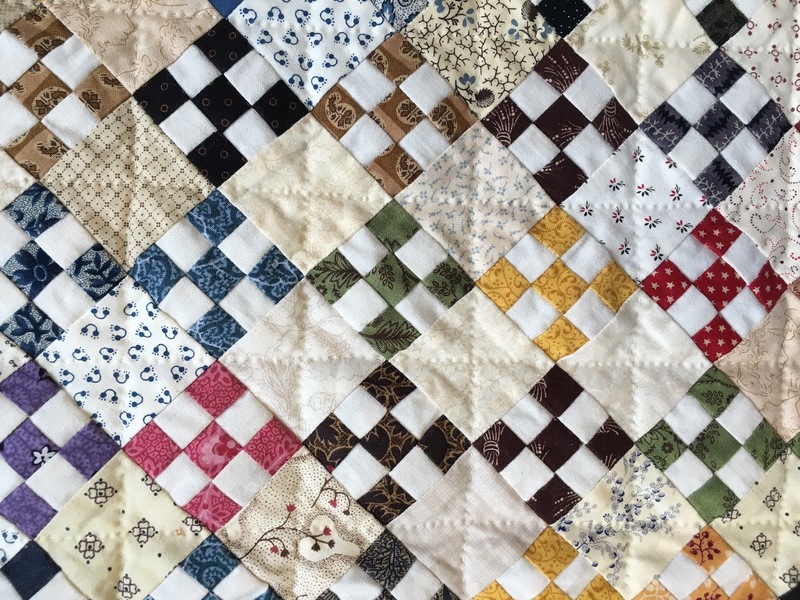 I love scrap quilts, but I like controlled scrappy. On this one I just decided that the blocks and colors were going to land where they land - no control - just grab a block and sew! And guess what? I won't do that again - lol! 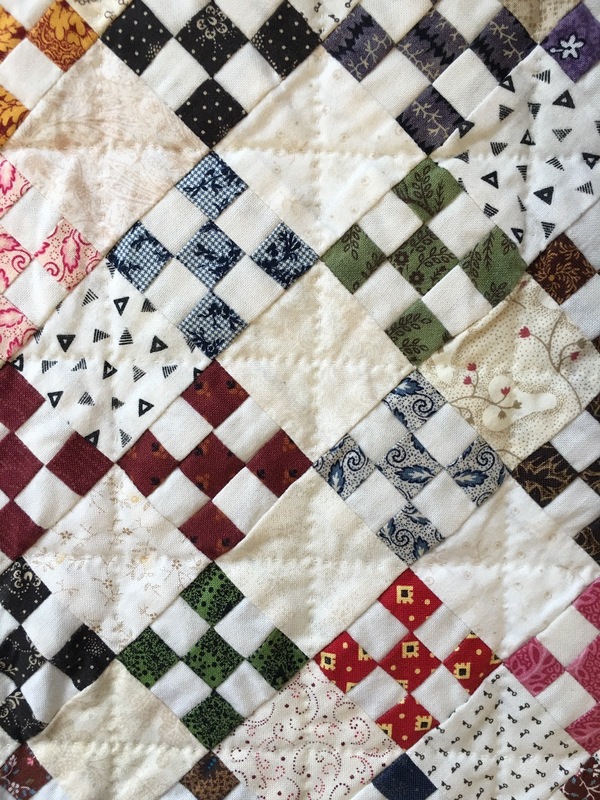 There is a spot in the quilt that just drives me crazy, but I'm not going to tell you what it is - you can guess if you want - and I will tell you if you are correct! It really is square (or close to it) but looks funny hanging there because it's been folded up in my "show stuff". Here are a few closeups,.. There are 2 things that people always ask me about this one - how long did it take to make it and how many pieces are in it. I honestly don't know how long it took (how's that for an answer?) because I didn't make any notes on when I started and finished like I normally do. And, it took a long time because I didn't work on it continuously - I would make a bunch of 9 patches until I got sick of them, and then I would put it away. At the time, I was making a lot of samples for my local shop, so I would make a sample for her, then use some of those scraps to make more 9 patches, then I would put it away again. Finally, I just wanted it to be done, so that is how the size was determined! It is 52" square, but honestly, I wish I would have made it bigger, but it's too late now! As for how many pieces - if I have calculated correctly, there are 6,301 pieces. I hand quilted this one as well - it went much faster than I thought it would - I just quilted straight lines through the setting squares, both ways. if you want to make one, I sell the pattern on my website - it is called Size Does Matter. I know I've mentioned my friend Nancy, who lives in California. We sew together via Skype a lot and she has been here to visit a few times. She is so fun and way too generous, and I was trying to think of what to give her for Christmas, when the idea popped in my head that I should make her a miniature version of this quilt! I don't think that I took a picture of it before I sent it to her, but she posted it on her 7th day of 7 quilts on Instagram - which is why I decided to post mine on my 7th day of quilts. That's the end of my quilt show for now! I hope to continue to post here more often, but we will see! Thanks for visiting! I have always loved this quilt! This pattern was in a Fons & Porter magazine and I believe it was featured on the cover. It's called Red Sky at Night and I made this in 2007. I hand quilted it as well - there are feathers in the red area and I stitched 1/4" in on each triangle. I took down my Trees Up! Lights on! quilt and replaced it with this one in my sewing room, so I will get to see it every day for awhile. I used many different reds, greens, golds and shirting/background fabrics for this one. Recently I shared my purchases from my trip to The Woolen Needle but I don't think that I mentioned what really FORCED (haha) me to go there. I did want to look for some wool and wovens to use for the Buttermilk Basin mystery sew-a-long, but then...I won an awesome giveaway from Thelma at Cupcakes & Daisies blog! She was giving away a gift certificate for $50 (now that is seriously generous!) at basically any place of your choice! It could be anywhere at all - how cool is that? So, since I had been thinking of making the trip to Woolen Needle, that is what I chose. So, it's all Thelma's fault that I bought too much at WN! Thanks bunches Thelma - such a generous giveaway and I was just thrilled to win! And if that wasn't enough, then Jess from Primitive Gatherings called and said that I won their drawing from their Valdani coupon event! I always order during their Christmas open house so that I can get the coupon book (because you know, there is ALWAYS something you NEED from PG!) and when they sent out the reminder for the Valdani special, I placed an order. There were a few colors that I needed and they have a couple of new ones, so I got those too. The prize was a $20 gift certificate, so now I'm going to have to order again! Isn't that just a shame?! After all that luck, I'm thinking I need to go buy a lottery ticket! Ok, hubby needs to work on my computer. I will post my last quilt soon! Another purple quilt! Can you tell that purple was once my favorite color (replaced by red!)? These are all Civil War reproduction fabrics (as are most of my quilts). Some friends and I went on a little road trip to Homestead Hearth in Mexico, MO, where I picked up some of these purples and the pattern - it was a free one by Jill Reid for Windham. I hand quilted this one too - straight lines 1/4" inside the lines on the blocks, orange peel in the sashing and a cable in the border. We have some company coming this weekend, so I'm cleaning a little and trying to get my piles organized! 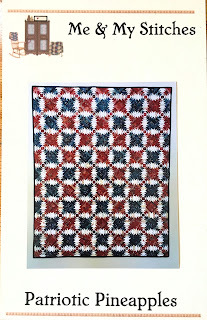 If you have read my blog for a long time you have seen this quilt and know the story behind it. If not...here goes! A few years ago, a good friend and I took a road trip to Wisconsin. We stopped at several awesome quilt shops, with a final destination of Primitive Gatherings. We stayed at Lisa's retreat house for a few days and it was amazing! While we were there, we drug Lisa off to a few different shops (she thought she needed to work, but we stitched in the car instead!) and she took us to her house and also to the warehouse. She gave me 3 huge boxes of scraps from her first 2 fabric lines. I have used tons of them - making so much jewelry, but I still had a lot left, and that is when I decided to design this quilt. I named it Gathering Scraps and it is a reminder of a great trip and great friends. I designed it specifically to cover 2 tall tables that I use when vending at shows - I wanted something to go over the top of the tables. When I finished the quilt, I sent Lisa a text showing it to her, and she called and asked if she could borrow it. At first I hesitated, because I had a plan for it, and I wanted it for an upcoming show. Then I decided that was stupid - a lot more people would see it if it were in her booth or at her shops. So I sent it to her and made a much smaller one to use in my booth (and did something else to cover my table!). Out of all of the quilts that I've designed, this one was my favorite to make (and it's a good thing, since I made 2). It goes really fast and it was just fun! I know Lisa has taken it to shows, and it's been in the shop in Wisconsin. Now it's in the California shop. I'll be back tomorrow with another quilt! Is anyone in shock that I am posting so much? You should be - it's a miracle. Here is the quilt that I posted on Instagram for my day 3 of 7 days. This is called Everlasting Wreath and was designed by Edyta Sitar. I really enjoyed paper piecing the blocks - it was fun to use lots of fabrics, and the yellow in the center is my all-time favorite yellow fabric. The trouble with this one is that when I went to sew it all together...not so fun! I hate y-seams, and that's what it is. Plus, the edges were not supposed to be straight, but I just couldn't deal with it, so I cut it all off. Then I couldn't decide how I wanted to hand quilt it. I remember asking the question on my blog and many people said Baptist fans. That was a big fat NO to me. In my opinion, Baptist fans are nice and they definitely have a place on some quilts, but I feel they are way over-used. So...I ended up just quilting around the center triangle, then stitching a straight line out from each one of the triangle points. It's really all this quilt needs - something simple to compliment the busyness of the pattern. Speaking of busy patterns, that is what I'm working on - finishing up my pineapple quilt so that I can have the pattern ready for our next show, which is in Dallas, TX in March (click to go to their website). YIKES!!!! Just one month away! I'm going to finish the binding today and try to get a decent picture - that is always the hardest part for me. We also have lots of jewelry and ruler boxes to finish up before the show. Here are a few that we finished over the weekend - some darks - earrings are 3/4" the pendants vary in size, with the largest being 1 1/2"
Here are some of the finished kitty pendants - all 1 1/4"
And it hit me that I had the perfect fabric to cover the back of these (so you couldn't see my hand stitching threads)...a cute Judie Rothermel shirting. Here are the fat quarters that I bought at The Woolen Needle (Williamsburg, IA) - aren't they pretty? At Inspirations (Hills, IA), I found this cool bee fabric by French General. Since my husband is a beekeeper I really want to start collecting some bee fabrics and this is my first one! I don't want the cutesy bees, so this was just what I had in mind. I hear there is one in red too, so I need to be on the lookout for it. This is my quilt for Day 2 of the challenge (on Instagram) by my friend Nancy. I made this in 2004 - it's called Ancient Stars by Sue Garman. Isn't it a great pattern? Right up my alley - lots of little pieces. At the time, I really liked purple, and did not have a big stash, so I collected purple, green and tan fabrics for awhile before I could make this. I know I've posted this on my blog before, but it's been awhile. This is a section of one wall in my sewing room. I made all of the quilts on the wall, except the pink one. They are all hand quilted, except the star - I did a cross hatch by machine. The corner chair came from my grandparent's house - it always sat inside their bedroom door. I just love this chair. The bear on the chair (haha) was made from one of my grandma's fur coats. The lawyer's case also came from their house. The quilts on the top shelf all came from family (though I'm not sure who made most of them) and the ones in the bottom are various quilts that I've bought at auctions. My aunt gave me the crock on the floor - I have wanted a Red Wing crock forever. It holds lots of scrap bags gifted from many different people. There's just a mix of stuff on top of the cabinet - the jar holds bindings that are ready to sew on, the bowl is just scraps. So that's day 1! Then we went to Williamsburg to The Woolen Needle (yes...I'm lucky to be close to these 2 awesome shops!). I've been thinking about starting the free BOM that Buttermilk Basin is offering. Have you seen it? It's really cute - it will spell out Let It Snow and is all wool applique. So far there is just one block released - the letter is red and it has a cute snowman on it. I decided that I want to make my letters blue. I had a nice blue in my wool stash that will be perfect, but I needed some "snow-like" colors, and also some backgrounds - something that will go with the blue and that you can still see the snow on. Here is the wool that I found. Love those grays - but that just looked boring, so I had to add the purple and blue to my pile! I also ended up with a bunch of fat quarters that I didn't need, but I loved them, so I bought them anyway, but that picture isn't showing up on my computer yet. DH gave me a new iphone for Christmas and sometimes the pictures load from my phone to my computer right away and other times they don't. Maybe they will show up tomorrow and I will post it then. Stay tuned for the rest of my 7 days of quilts. I love posting on Instagram (I know I tell you that almost every time I post! ), but for this challenge, I wanted to give a little more detail on the quilts that I'm showing - so I will post them here as well. Hope you are having a fun Superbowl Sunday! I saw these fabrics online and knew they would be just perfect for my jewelry - aren't they pretty? The line is called "Trinkets" by Kathy Hall. I ordered mine from Fat Quarter Shop online. And I cut into them yesterday so I got to pet them all individually - lol! I made more kitties and I think these are all sold already, so will need to get that fur fabric back out and make some more! I was tagged on Instagram by my friend Nancy and challenged to post a quilt a day for 7 days. You can go there to see my first post . I just sold the last kitty pendant that I had on hand, so that is what I'll be doing today! They are 1 1/4". I recently had a special order - matching heart pendant and earrings - with bling on all - fun!